Opened in 2008 in the East Village, Ippudo NY certainly wasn’t the first ramen restaurant in the city, but in a few short years it’s become one of the best known. With an 80-seat dining area that is always packed and with wait times creeping toward an hour, Ippudo, part of a successful chain in Japan, is one of the most talked-about ramen-yas in New York. In Japan during the 1970s and ‘80s, ramen was considered fast food for the salaryman who wanted to grab a quick bite before going home, often after a night of drinking. The ramen restaurants were, in general, small and dingy, and the ramen itself was usually very rich and oily. Some were standup-only establishments where men quickly slurped down a bowl of ramen en route to catching the last train. When families went out to dinner, ramen wasn’t a typical choice. Shigemi Kawahara owned a bar in Fukuoka, a city in Kyushu in southwestern Japan. In speaking with his female customers, Kawahara realized that it was time for ramen to appeal to a wider audience. So he developed a new recipe for tonkotsu ramen, a pork-based soup that originated in Kyushu, and in 1985 opened a space that was small (only ten seats), but had a cozy and attractive interior. Ippudo was born, and in time it became popular throughout Japan. When Kawahara decided it was time to expand the franchise overseas, there was no question he would open a restaurant in New York. He knew native Japanese living in the city would patronize his restaurant; instead, his focus was on introducing ramen culture to Westerners and other non-Japanese. But it was important to Kawahara to keep his Ippudo concept intact, staying true to the authentic recipes,the design of the restaurant, and the Japanese standard of customer service. 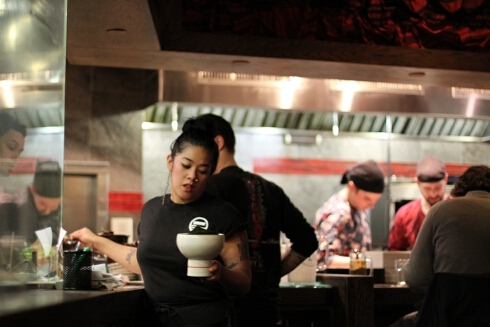 Ippudo sent its master ramen chef from Japan to New York to replicate Ippudo’s recipes. Because of differences in water quality between New York and Fukuoka, the master chef had to reformulate Kawahara’s original recipe. According to Itoh, water, acidic or alkaline, is critical to Japanese noodles. Apparently timing is everything when it comes to noodles. Ramen is at its best when it’s eaten right away, and the Ippudo staff took that into consideration. Ippudo NY is almost three times as large as their other restaurants, so the master chef factored in the time it would take the server to deliver a bowl of ramen to the customer. “The biggest difference is how many minutes will it take for Japanese to finish the ramen and for the local people to finish the ramen?” says Toshiya Suganuma, the Director of Ippudo. Calculating the distance and time from kitchen to table, Ippudo’s master chef adjusted both the cooking time and the thickness of the noodles, which are handmade each day at the restaurant. The noodles served at Ippudo NY are thicker than in Japan to accommodate the water issue, and each day the staff uses a micrometer to ensure the proper measurements. Does the average customer notice the great lengths to which the Ippudo staff goes in order to serve him the perfect, most consistent bowl of ramen? “Maybe ninety-five percent doesn’t notice, but for that five percent, it’s worth it,” says Suganuma. 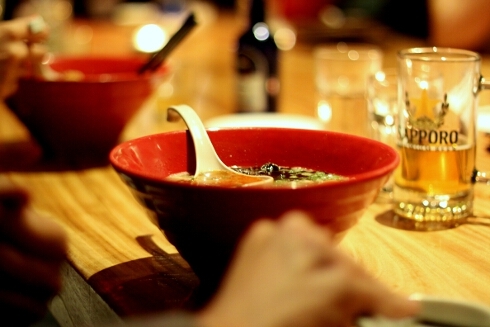 As the ramen craze grows in New York and worldwide, so does the Ippudo franchise. In addition to Japan and New York, there are Ippudo restaurants in Singapore, Hong Kong, and Korea. New restaurants are finding homes in Shanghai and Sydney, and in December Ippudo’s Midtown location will open. 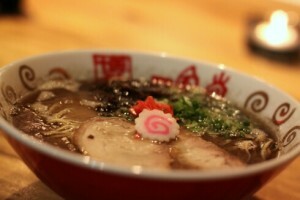 To Itoh, the key to Ippudo’s success is their desire to maintain the consistency that creates the best possible ramen. The first meal I have upon arriving in Tokyo, Ramen. I live on Cape Cod, MA. I wish Ippudo was closer or they open one in Boston?